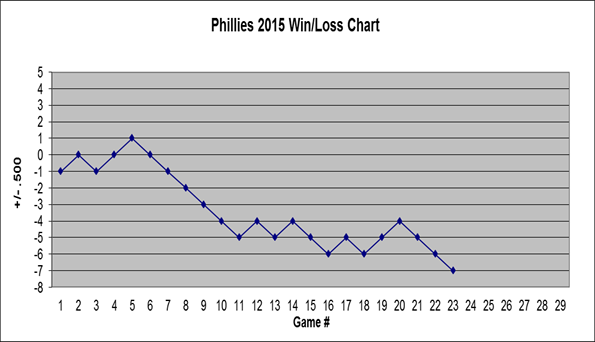 The first month of the season ended with the Phils at a place where most expected them to be: in last place. Their offense has been virtually nonexistent, finishing the month in last place in six major statistical categories. Not much went right overall for the Phillies, who were above .500 for just one game and already find themselves 7 games back in the NL East. Game 1: The weather was perfect but the Phillies were not. Hamels allowed 4 solo homers on Opening Day and Jake Diekman allowed a grand slam in the 8th inning which put the game out of reach in an 8-0 loss. Game 2: Aaron Harang tossed 6.1 scoreless innings and Jeff Francoeur broke the Phillies' 14 inning scoreless streak with a 3-run bomb in the fifth inning in a 4-2 win. Game 3: After a strong Spring Training, David Buchanan allowed 6 ER in 3 innings and Phils dropped first series to Boston. Game 1: Jerome Williams allowed just 1 run in 6 innings and the Phils scored 4 in the 7th in a 4-1 victory. Game 2: Odubel Herrera's first MLB hit came as a walk-off double in the 10th inning, as the Phils beat the Nats for the second straight day and jumped over .500. Game 3: Sean O'Sullivan gave a strong outing, but the Phillies allowed 2 in the 10th and their one-run rally wasn't enough in a 4-3 loss. Game 1: Harang gave the Phillies 6 strong innings of one-run ball, but they couldn't score off Jacob deGrom in their 2nd shutout of the season. Game 2: In a packed Citi Field, the Phils hit three homers off Matt Harvey in his first home start, Chase Utley hit two homers, and the Phils hit four homers total, but the Mets finished on top in 6-5 loss. Game 3: Jerome Williams allowed 5 runs in a 6-1 loss and the Phils were swept by the Mets. Game 1: Cole Hamels had a rough start, allowing five runs in 6 innings, while the Phillies only mustered 2 runs off Doug Fister in the loss. Game 2: A three-run first off O'Sullivan for the Nats was enough, as the Phils lose 7-2 for their sixth straight loss. Game 3: Ben Revere entered as a pinch-runner in the 7th inning of a 3-3 game, stole second, advanced to third, and scored the go-ahead run in a 5-3 win. Freddy Galvis had two RBIs and the Phils snapped a six-game losing skid. Game 4: Steven Strasburg threw just 21 pitches through the first three innings and dominated the Phillies, who finally broke a perfect game in the fifth inning, but it wasn't enough in a 4-1 loss. The Phillies finished with a 1-6 record on their first road trip. Game 1: The Phillies scored multiple runs in three innings and Howard hit his first homer, as the Phils cruised past the last place Marlins, 7-3. Game 2: The Phillies wasted another strong Hamels outing in which he allowed just 1 unearned run. Luis Garcia balked in a run to break a 1-1 tie in the seventh and in the eighth, Utley committed an error and Herrera made a three-run error in an ugly 6-1 loss. Game 3: The Marlins scored four in the 4th off emergency starter Dustin McGowan, the Phillies were charged with 2 errors, and they scored just once in another embarrasing loss. 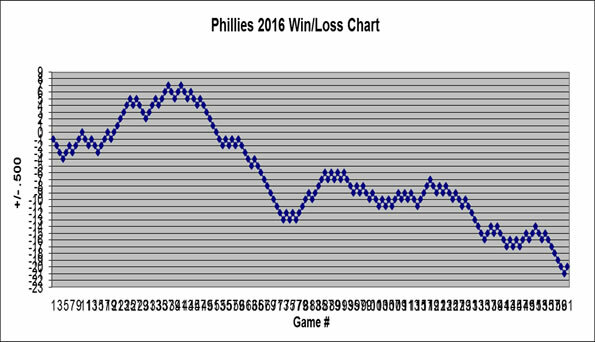 The loss came in front of a record low 17,097 fans and dropped the Phils into a tie for last place. At the time, the Phillies were tied for the most errors (17) in baseball, had the lowest average (.213) and runs scored (41) in all of baseball, while allowing the second-most walks (67) in baseball. Game 1: Aaron Harang dominated the Braves with 8 shutout innings and the Phils were tied at zero entering the ninth, but with Galvis at third, a Ben Revere botched grounder to first scored the lone run in a walkoff 1-0 win. Game 2: David Buchanan took a no-hitter into the fifth and held the Braves scoreless through six, but after allowing a leadoff homer in the 7th and consecutive two-out walks, Jake Diekman came in and allowed three runs to score in an eventual 5-2 loss. Game 3: Howard hit a 3-run homer and Galvis went 3-for-3 as the Phils took the series against Braves. Game 1: Down 1-0 in the 7th, the Phils scored 3 runs and Cole Hamels finally earned his first win. Game 2: Severino Gonzalez was charged with 7 runs in his major league debut in an 11-5 beat down. Game 3: Harang was tagged for 4 runs in the fifth and suffered his first loss of season. Game 4: David Buchanan was roughed up for 7 runs in 4.1 innings as the Phils lost the game and the series. April 11 - Odubel Herrera's first Major League hit was a walk-off double. 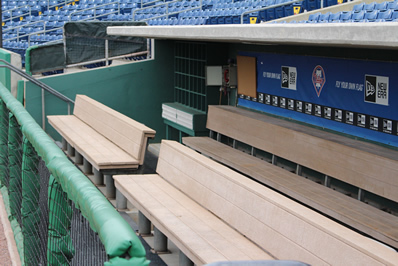 April 23 - Phillies attendance of 17,097 marks the lowest in Citizens Bank Park history. --Chase Utley finishes month with a .114 batting average that was the worst among 184 qualified major league hitters. April 28 - Phillies activated Domonic Brown from the DL but send him to the minors.